Thai calamari was excellent. Loved the cornbread baskets the server gave us. Bert friendly staff. One word amazing. 9/10 ambiance, 9/10 customer service, 9/10 food. Just absolutely an overall great experience. I just love their quesadillas. Just the perfect amount of hardness. Their salads with chicken on them is just exquisite. The fries and onion rings are huge and delicious. Highly recommend. Love The Spare Rib !!!! Good food and service. The portions are huge! Las más ricas bbq ribs están acá , el pan de maíz que sirven de entrada riquísimo Calientito el lugar limpio , agradable y el personal no se diga muy amables. Muy recomendado el restaurante. The food was excellent and the portions were rather large. Service is friendly. Delicious! Large portions and friendly staff. Our party had the chicken salad in an avocado, fried chicken, ribs, burger, and French onion soup. The root beer is also homemade! Love this place food is always good! Happy hour is great! Great ribs,big portions. From the salad and appetizers to the main Course delicious. My baby back ribs were good but my husband's St Louis ribs were very dry so he sent them back and the second rack wasn't much better. The service was so so and my coleslaw didn't have much flavor. First bad experience there I hope it was just an off night. Such a great place. Wonderful consistency each time we've been there over the past 30 years. Lunch special portions are great. What I love about this place is the food. The consistency from all the times I've been here over 30 years is amazing.As long as this place is open, I'll be back. Great ribs, the riblets were delicious. They have more food options besides ribs too. The service was very good and there is parking. Service was great. Food was tasty! ! Aeh, I was invited by a friend to have lunch here... It was ok, nothing extra ordinary here. Not what you might expect for a rib house, but this place has the most amazing baked clams. I actually will rarely order them, unless I am here. When I am at the Spare Rib, I pass on dinner and order two appetizers of baked clams. I believe there is about 8 per order. You get your money’s worth ,very large portions , great taste , great service , highly recommended. I've been dining here for a long time and I'm not sure if ownership has recently changed or just management but something is off. Long wait for a waitress to come over, long wait for food, which is slipping in quality. This is one of my favorite neighborhood restaurants, so please pay attention to your service and food. Had an absolutely Lovely Experience, Had To Wait a BIt To Be Seated,,?,. But, SO Worth The Wait! ((DeeeLucious)) & Waitresses Were So kind,, Attentive and Incredibly Hot! If you're ok with the major caloric intake than you'll love this place lol Please get the onions rings, you must see them in person. Above average ribs, really good prime rib, very good chicken. Our favorite place - The food & Service is Great - Never Disappointing !! 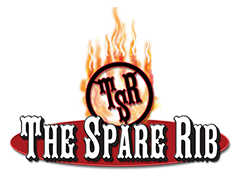 We Love The Spare Rib. Fred and the crew knock it out of the park.Great Taste,Service and a real feel at home surrounding . Best ribs on Long Island!!! Food is always great , nice prices and always a nice selection to pick from. The food is over spiced, even when you tell them no spices. Steak fajitas should be easy, but clearly exceeded the cook's ability. A shame because my dinner partners loved their meals. Food was great and plentiful. Service was fast and friendly. Was busy, but we were seated quickly. The Ribs were very Good! Always good food, usually good service. Prices have drifted up over the years (first went about 25 years ago) but when you have to complete with Outback etc. it is hard to be the best value in town. The onion loaf appetizer and the broasted fried chicken are both superb. The ambiance was clean and friendly. Our waitress was friendly, attentive and attractive. The place was packed, however, we were seated in less than five minutes. The Ceasar salad was good, as for my rib dinner the meat was tuff, far from a slow cooked rib that falls off the bone. My spouses fried chicken dinner was of KFC caliber. We have been coming to this restaurant for about 20 years. Everything about this restaurant from the delicious food to the service is great. Our favorite is the chicken and ribs. The prime rib and the burgers are unbelievable too. Love the catering. It is my go to for bbq and fried chicken. Missed a star because my takeout bbq chicken was completely burned onetime.